Street Triple R. Illustration courtesy of Triumph, USA. In my world of street riding and sport touring, one of the features that I like best is responsive, linear power delivery. What this means is that when you roll that throttle on, no matter what the gear, RPM or speed, you receive an even responsiveness that does not require five figure revolutions to exit corners or pass slower traffic. Historically, this has meant I have favored 900-1100cc displacement twins and fours. The breadth of both horsepower and torque allows the use of tall final drive ratios. Engines of this size turn fewer revolutions on the highway, are quieter, vibrate less and have the potential for longer life and durability. In addition, the fun factor inherent in a large motor means that easily accessible power makes me grin while riding. Up until now, I have not sampled a mid-displacement engine of 600cc or somewhat larger that has had this kind of real-world flexibility and excitement. If you are an experienced rider, you understand this. I have ridden many of the 600-650cc sport and sport touring Japanese motorcycles, including the Honda CBR600F3/F4i and 650 Hawk, Kawasaki ZX6, Suzuki SV650 and Yamaha XJ650J Seca, Turbo and R6. The twins among them had far better and linear torque curves at lower RPMs than did any of the fours. Triumph has made its modern reputation with their liquid-cooled triples. These engines combine the best characteristics of twins and fours in that they have the muscular and linear torque band of a twin, as well as the ability to rev and build horsepower like a four. Properly engineered, they can weigh less than a four. Fuel capacity: 4.6 U.S. gal. When I swung my leg over the Street Triple, its light weight was noticeable. It is easily 100 pounds lighter than most of the liter-class motorcycles I have ridden. This means that it is easier to move around in the garage, easier to steer on unfamiliar and tight roads and easier to handle at the end of a long day on the road. 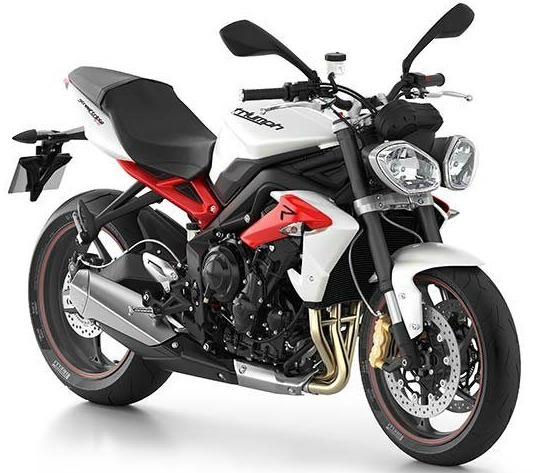 Unlike a dedicated sport bike with its layer of aerodynamic plastic and clip-on racing handlebars that require an uncomfortable crouch to ride, the Street Triple comes with a 7/8 inch chromed steel handlebar on bolt-on risers over the upper triple clamp. This means is that the rider can use the bike as is, or simply change the handlebar if it doesn't suit their needs. The riding position is somewhat akin to a standard motorcycle. The location of the seat and handlebars place the rider in a gently forward leaning posture. It helps reduce the tendency of the wind against your chest to turn you into a sail at highway speeds, but also provides a comforting level of control without the wrist pain of a race-replica sport bike. The foot pegs are situated between a standard location (more of less directly below the knees) and the very tall and rear-set pegs of a race bike. Your knees are not folded as severely as a true sport bike and the very slight forward lean of the handlebar allows your inner thighs to take up some of your body weight. The slightly higher pegs afford more cornering clearance and lean angle, which makes the Street Triple exhilarating to ride on sinuous pavement. The Street Triple R has slightly upgraded suspension, compared to the standard Street Triple, as well as Brembo Monobloc radial calipers to justify its $600 higher asking price. Both bikes have standard ABS for 2014, which is a major safety advantage for any motorcycle. A test ride on a Street Triple R showed me the comprehensive engineering and thought that Triumph provided in this ultimate middleweight. Steering into a corner felt as if the bike was anticipating my thoughts. Of course it wasn't, although it did seem that simply leaning my shoulder into corners initiated the turn and the need to give the inside grip a shove (counter steer) was nearly absent. Suspension quality felt firm and well-damped. Whether the bike was ridden on smooth sweeping turns or rutted urban pavement, the feeling of control and knowing where your wheels were was reassuring. The fully adjustable suspension offer compression and rebound damping and spring preload changes that can compensate for rider weight, bike load, road quality, or wheel control. Braking was similarly firm and powerful, with four piston calipers and floating rotors that are nearly of race bike quality. The ABS system is comforting during panic stops. However, all of this pales in comparison with the motor! Here was the first mid-displacement motorcycle I have ridden that gets with the program instantly. More than a matter of spooling up revolutions quickly, you can nail the gas in top gear at under 50 MPH and find yourself accelerating better than an 1100/1150cc BMW twin or Harley Sportster. Finally, a 650-class motorcycle that has the breadth of power band that I thought limited only to liter bikes. While a dedicated 600cc sport bike will build more peak horsepower, their top-end weighted and narrower power band is less practical for general street riding. The Street Triple's 12,000 RPM redline is much higher than the 6,500 to 11,000 RPM of modern liter-class bikes, but below the stratospheric 14,000-16,000 RPM of the race replica sport bikes. Nor does the Street Triple require the gearbox stirring of the latter. In a lot of ways, Triumph's triple engine re-emphasizes the word MOTOR in motorcycle. Yet, as a modern fuel-injected product that meets emissions and noise regulations, it makes prodigious power everywhere and offers class-leading fuel economy, as well. The Street Triple also eviscerated my long-standing bias toward the large displacement motorcycles, due to their heretofore broader torque spread. This thing has so much torque that one could even gear it higher. Right now, it turns about 4,500rpm at 60 MPH. For a rider with large displacement twin experience that seems like a lot of revs. However, when you consider that this engine speed is little more than one-third of the redline, you can well understand the flexibility inherent in this engine, as well as the fuel-economy and more relaxed sound that a taller rear sprocket might provide. While I appreciate and understand the effortless and sometimes brutal lunge of a liter bike when you pin the loud handle, the 675 has enough real-world power to satisfy all but the most jaded moto-head. If one wanted something utterly easy and fun to ride, a playful companion for the morning commute or in the hills, one could hardly do better than the Street Triple. Just thinking about the thing makes me smile. Note: Many thanks to Rod Johnson of Cycle Parts Triumph Motorcycles of Eugene, Oregon for providing the Street Triple that is the subject of this review. Copyright 2014 by David Tong and/or chuckhawks.com. All rights reserved.